As I approach the end of my project visiting every sidewalk in Oakland, there will come times when it takes more time to find a new maker or date than I have time to walk the streets. After more than seven years, that time has come and for now I don’t have a new mark lined up. When this happens, and it will inexorably become more common, I’ll put up some of the other interesting sidewalk markings I’ve run into over the years. 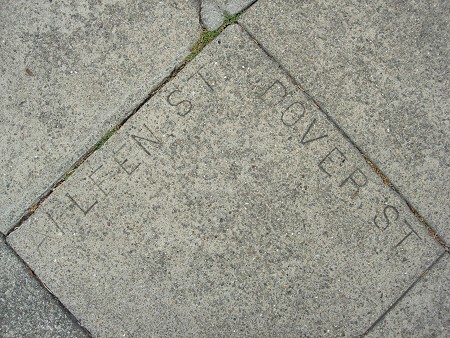 A number of street corners have the respective street names stamped into the concrete. They aren’t signed and dated. This mark at the corner of Aileen and Dover Streets has been eliminated since I documented it a few years ago. This entry was posted on 27 March 2015 at 12:01 am and is filed under Special marks. You can follow any responses to this entry through the RSS 2.0 feed. You can skip to the end and leave a response. Pinging is currently not allowed.